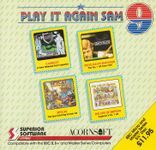 This is the ninth release in Superior Software's popular series of Play It Again Sam compilations. Camelot - A platform puzzle game originally released on this compilation. It subsequently had a standalone release through Blue Ribbon. Steve Davis Snooker - A snooker game by CDS Software. Spycat - An action-adventure game where you take the part of a disgruntled spy who wants to steal some classified material and retire to write his memoirs. The Life of Repton - A standalone level pack using the Repton 3 engine.